Mesoamericaa, Highland Guatemala, Maya. Early Classic, AD 200-550. Ceramic. 7 x 5 1/8 in. diam. Ancient American peoples almost universally believed in the existence of an “animal spirit companion” for every human being. Shamanic spirituality includes the visionary experience of transforming into one’s animal self during ritual trance states. 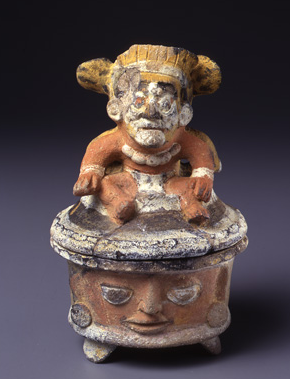 This belief in the equivalence of human and animal is portrayed with unusual literalness in this early Maya ceramic incense burner. On one side of the lid is an elderly Sun God in human form and on the other a jaguar, representing the Jaguar God of the Underworld. Their physical unity and identical postures show that they represent the two aspects of a single being. Notice in the side view of the piece how the spots of the jaguar meet the skin of the man in a wavy line. In Maya hieroglyphic writing the sign for “animal spirit companion” likewise shows a wavy line separating jaguar spots and a human face. Therefore, this piece is a three-dimensional version of the word for one’s animal self. 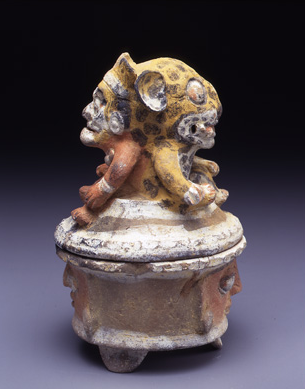 In this case, the dual lid figure also symbolizes the Maya belief that the sun becomes a jaguar at night as it traverses the Underworld. This image was to be seen with the aromatic smoke of burning pine resin seeping out from between base and lid. This means that the dual figure would have been wreathed in smoke, partly visible, as in a vision or dream. In this way the design of the object complemented its subject. Smoke was considered a properly ethereal mode of communication between the human and the supernatural realms.